Iran narrowly won the 2009 Jones Cup tournament title in a unprecedented and bizarre four-way tie. First of all, sincere apology to one of the readers who left comment on a previous post. The Jones Cup did use total points to determine the final winner. A total of four teams tied at the first place with 14 points, including three that finished 6-2 -- Iran, Lebanon and Taiwan -- and Jordan, who only got 14 points despite finishing 7-1. Jordan received no points after boycotting the Iran game. As a result, Jordan failed to win its third straight Jones Cup title and finished as runner-up. Lebanon placed third as it beat Taiwan, who ranked 4th. The game was delayed for more than a hour because of the clock problem, but that didn't stop Iran from humiliating Philippines. 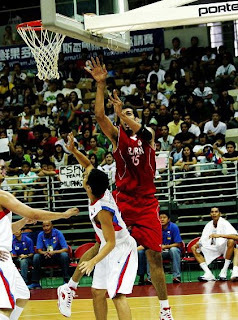 Iran routed Philippines by 25 points, 85-60, and finished the 2009 Jones Cup with 6 wins and 2 losses while Philippines going 2-6. Hamed Hadadi, who was sidelined yesterday due to a bad stomach, had 19 points and 12 rebounds as Iran dominated with its height advantage and led by as many as a whopping 34 points. "We didn't have answers against Iran's height advantage and our three-point shots did not fall. That was why we didn't have a chance, " said Philippines head coach Yeng Guiao. Hadadi said he still doesn't feel well today but he's made up his mind to play in the final game. "I have sat out too many games here. If I don't play, this Taiwan trip would be meaningless for me, " he said. Cheered by the home crowd, Taiwan quickly jumped in front since the opening tip and took a 20-16 lead in the end of the first quarter. Taiwan led by six at the half. Lin Chih-chieh made three 3-pointers in the third quarter to increase Taiwan's lead to double-digit while Korean starting center Kim Joo-sung was plagued by foul trouble. With a seemingly comfortable lead, Taiwan became careless as they committed too many turnovers in the final quarter and gave Korea a chance. Lee Kyu-sup made two free-throws with 4:44 to play and cut the deficit to four, 67-63. 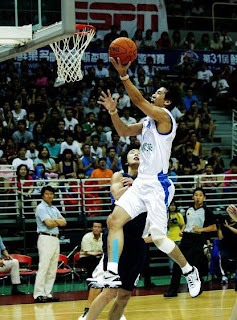 Lin Chih-chieh's fourth 3-pointer in the second half was the wake-up call, igniting a game-clinching 9-0 run which included a two-handed dunk by Tseng Wen-ting and made the score out of reach, 76-63, with two minutes left. 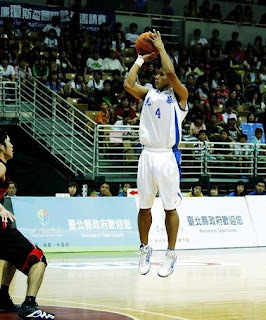 Chang Chih-feng led Taiwan with 21 points. Tseng Wen-ting and Lin Chih-chieh scored 17 apiece while Tien Lei had a double-double of 12 points and 13 rebounds. Taiwan outrebounded Korea 35-25 and that proved to be the key. "We grabbed more rebounds on both ends of the court and kept pounding inside on offense. Those were the main reasons why we won today, " said head coach Chung Kwang-suk. Korea was not at its full strength in the game as forward Kim Min-soo still suffered from illness and played less than 10 minutes. 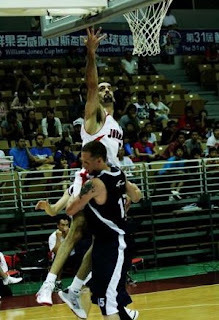 In other games, Taiwan 2nd NT beat Japan 97-91. Japan used only five players in the game after losing some players to bad stomachs and others on injuries. Jordan beat Kazakhstan 96-77. Zaid Abbas led Jordan with 23 points. Alexandr Tyutyunik had 26 points for Kazakhstan.